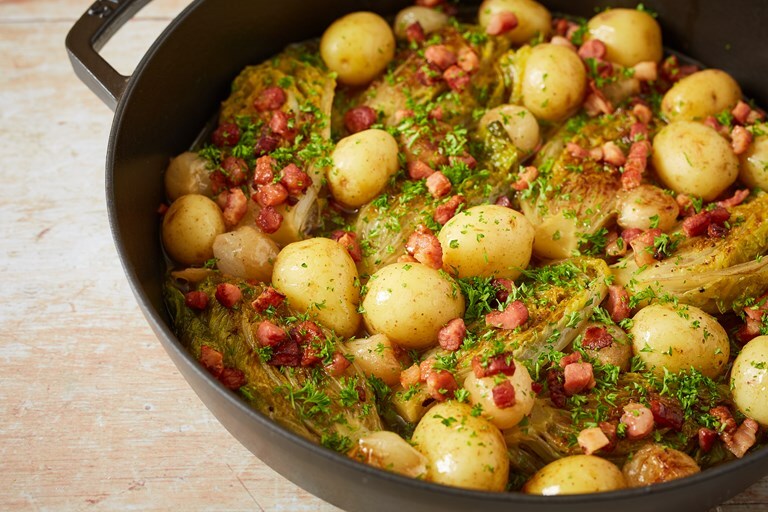 This braised lettuce recipe pairs beautiful baby gem lettuce heads with buttery Jersey Royal potatoes. The salty kick of the bacon, sweetness of the button onions and plenty of fresh parsley brings everything together in a harmonious springtime dish. See Anna's other lettuce recipes here. This is a good lunch dish. It is also an excellent accompaniment to roasted meats and fish (in which case omit the bacon). Fresh, tight lettuce heads are preferable here as they will hold their shape better. Alternatives: to make this a slightly more decadent lunch, a poached egg can be added on top. The bacon can be omitted if you want to keep things vegetarian.